You are my hero! Congrats Loreen. Hope it sells millions! Congratulations! Looks super. I'd guess that a youtube movie should go along to help with the marketing... or so they say. Wishing you great success for this book and all our others!! Looks great, Loreen - I'll buy it for my iPad a little later! I am so behind on all of this. Thanks for the quick lesson! This is fantastic! Congratulations, Loreen! I plan on purchasing it when I get an iPad soon. Wishing you much success with it. Congratulations, Loreen!!! I love the book trailer... the sounds are so evocative... it is making me want to run out and buy your app :o) And I will. Hope it will just be one of many, many, many, purchases... hopefully even millions... like Maryann said. You are also making me excited about trying out book creator. Thanks for the comments and you're very welcome! As soon as I played with the Book Creator app, I knew making an iBook was "doable," if you know what I mean. By the way, you don't have to publish via the iBookstore, you can sell the EPUB files from your web site. Also, the Book Creator dev has said that they're working on a way for authors to add audio files so that the text can be read aloud as each word is high-lighted (or at least I think that's how it works.) iBooks already supports that feature. Congrats- looks great. I still don't know why I was not approved by iTunes. Did you set up ISBN with Bowker? Did you give your SS number to Apple or did you create a business tax ID? I have one and submitted that, but got no reply of any sort. This is back in May. I have a Bowker ISBN. I am trying to figure out why I never heard from them at the first application process. I did not get a chance to upload the book itself. You don't need any ISBN numbers to apply to be an iBookstore seller. (You do need one ISBN per iBook later for uploading. Bowker is the only direct way to get ISBNs in the U.S.) I used my S-corp tax I.D. number. Apple sent an email that said my application had been approved. No idea what their criteria may be. Perhaps you missed hitting some button and the application was never sent or some glitch like that. This is so cool. Great job figuring it out and best of luck! I've been trying to figure this out for some time - which direction to go to produce an ebook and this looks doable. Thanks for the tips. How was it working on the iPad? I'm so use to working on the computer that the iPad seems small. The actual work on the iPad goes pretty quickly because you select/position the artwork, then type/style/position the text, then move on to the next page. Re the text, you can paste it in rather than type it on the dinky iPad keyboard. Congratulations and thanks for sharing these really useful tips! 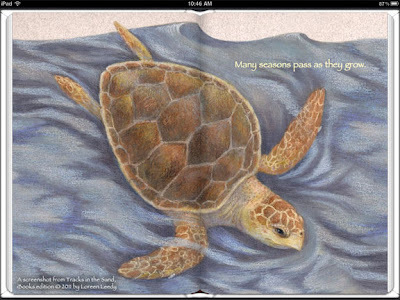 We'll spread the word about your app as far and wide as the sea turtles swim!! Just to clarify, this edition of Tracks is not an interactive app, it's an ebook that is read inside the iBooks app. Thank you so much for explaining your process of creating this lovely iBook for us. I really do need to learn all this stuff, and I know your shared experience will help me when I start to find my way with this new technology.